Johnston, A. W. The alphabet. (編) Stampolidis, N.; Karageorghis, V. Sea Routes from Sidon to Huelva: Interconnections in the Mediterranean 16th – 6th c. B.C.. Athens: Museum of Cycladic Art: 263–276. 2003. Macrakis, Stavros M. Character codes for Greek: Problems and modern solutions. (編) Macrakis, Michael. 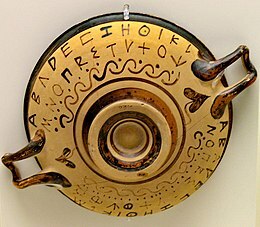 Greek letters: from tablets to pixels. Newcastle: Oak Knoll Press. 1996: 265. Murdoch, Brian. Gothic. (編) Brian Murdoch and Malcolm Read. Early Germanic literature and culture. Woodbridge: Camden House. 2004: 149–170. Sims-Williams, Nicholas. New Findings in Ancient Afghanistan – the Bactrian documents discovered from the Northern Hindu-Kush. 1997 [2014-01-30]. （原始內容存檔於2015-10-31）. Swiggers, Pierre. Transmission of the Phoenician Script to the West. (編) Daniels; Bright. The World's Writing Systems. Oxford: University Press: 261–270. 1996. Woodard, Roger D. Attic Greek. (編) Woodard, Roger D. The ancient languages of Europe. Cambridge: University Press. 2008: 14–49.